Mold Pros believes in “Green” as well as in mold removal and with the use of MaxGuard products, we’re able to practice not only our beliefs but also our services. MaxGuard is the only full line of Mold Remediation technologies formulated to meet the highest safety standards and environmental concerns in the treatment and removal of mold. MaxGuard Protective Coatings are the perfect products for use on surfaces not easily seen, such as wall cavities, ceiling/floor joists, crawl spaces and attics. 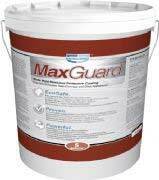 MaxGuard coatings also come with a Lifetime Performance Guarantee.